I guess some lawsuits belong under the “better late than never” category, at least according to Cypress Hill backup singer Michael “Shagg” Washington who is just getting around to taking Rockstar Games to court for allegedly stealing his image for 2004’s Grand Theft Auto: San Andreas. Mr. Washington, who says he only recently found out about the game’s existence this past July thanks to his nephew, bases his lawsuit on the claim that Rockstar interviewed him on various topics relating to his youth such as gang life and riding bicycles with said gang (yes, really). Mr. Washington was told, after he was “allowed” to leave, that if Rockstar decided to use his likeness in the game, he would be notified and compensated. Somehow the nearly six year old game managed to escape Mr. Washinton’s notice despite the fact that he recalls being questioned by Rockstar for thematic elements used in San Andreas. Furthermore, he believes that the character CJ is entierly based on him, and he’s looking to be reimbursed to the tune of twenty-five percent of the games total sales-approximately two hundred and fifty million dollars. This isn’t exactly life-changing news, but I thought it was humorous enough to share with you guys. 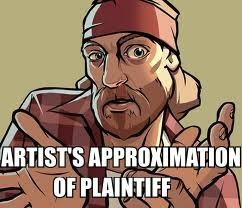 What is with the recent trend of celebrities suing video games years after they come out for frivolous reasons? Probably because they’re running out of money and video games look ripe for the picking. If you’ve got any thoughts, feel free to leave them in the comments below. Anyway, this guy is just. No. No, he loses. Lol, I love the picture ! !